On June 24, the Turkish people are set to vote in their country’s 2018 General Election, sixteen months ahead of the originally scheduled date. Voters will head to the polls to elect their new president following a series of major changes made to the constitution last year, designed to give additional powers to the newly elected president. On the same day, elections will also take place to decide who gets a seat in a parliament which has been extended from 550, up to 600 seats as part of the constitutional amendments in the 2017 referendum. Should no candidate secure more than 50 percent of the vote in the first round of the Presidential election, a run-off is scheduled for 8 July. Polls are split, although within the past week there are indications of a possible sway towards the opposition alliance. Five rival candidates are also in the running which could pose a significant threat to Erdogan, particularly if he fails to win outright in the first round of voting. The timing of the presidential and parliamentary polls is crucial, amid a troubled economy with Inflation spiked at over 12 percent, the worst since 2003, and the Turkish lira now worth 20 percent less in value against the dollar. Unemployment is also up and these issues are not something Erdogan has had to contend with in previous elections. Being perceived as the economic saviour amongst ordinary Turks, the economy has always driven his campaign message to success. In addition to the economic woes, relations with Turkey’s western allies are becoming increasingly strained as differences over key issues such as Syria and Kurdish militias who operate in the north supported by NATO. Defence procurement is also a key issue with U.S. Congress split over the decision to sell the F-35 fighter to Turkey, particularly following the Turkish government’s decision to purchase the Russian made S-400 missile defence system. However, it is not just Turkey’s allies which are cause for concern. Instability along the southern border with Syria is likely to be a major election topic, with old enemies Iran and Russia both heavily embroiled in military action within close proximity of Turkey. Additionally, allied support for Kurdish groups throughout the region has increased, with U.S. forces operating alongside the YPG in Manbij, Aleppo Governorate, as part of a wider campaign against the Islamic State group in the region. Potentially, this could be the very reason Erdogan has called a snap election so soon and completely out of the blue. The economic situation is likely to deepen before it can improve and he knows Turkish voters impacted by a weak economy could be swayed by the promise of a better future than the current situation under the Justice and Development Party (AKP). Bringing the election forward could be an attempt to prevent that from happening. At the time of the announcement in April to bring forward the elections, few would have doubted Erdogan’s ability to resume power. It was perceived that the centre-left Republican People's Party (CHP), led by Kemal Kilicdaroglu, was of no significant threat, given that it had not won against the AKP in 12 consecutive elections since 2002. However, Kilicdaroglu took the unexpected decision to stand down as party leader, and instead appointed Muharrem Ince to take over. 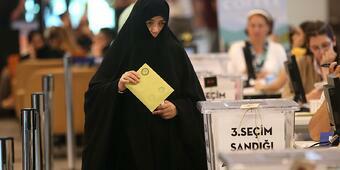 The move was clearly aimed to bolster the capability of the party to go up against Erdogan and the AKP. To further strengthen their position, the CHP had exploited President Erdogan’s own recent electoral reforms in which he made changes so as to allow his party to form an electoral pact with the Nationalist Movement Party (MHP), due to concerns about a drop in voter popularity. The reforms meant that parties could now form a pact to circumvent a 10 per cent minimum vote requirement to enter parliament. As a result, the CHP has formed an opposition alliance alongside the Good Party (İyi Parti), the religious conservative Felicity Party (Saadet Partisi) and the Democrat Party (DP). As of writing, the pro-Kurdish Peoples’ Democratic Party (HDP) is running for parliament outside of the alliance; however, CHP party leader, Ince, has extended an invite for them to join in the election battle as an opposition alliance. This could prove to be a key factor. The very fact the opposition has been able to coordinate an alliance is unprecedented, however, if the HDP were part of this it could sway the polls given the Kurdish vote is as much as 10 percent of the electorate. With stronger leadership for the main CHP opposition party and backing by a broad alliance which looks cohesive, the president is potentially facing the most challenging opposition since coming to power in 2003. The situation remains unclear however without a majority in parliament; Mr Erdogan would be forced to rule by executive decree, which could effectively undermine his ability to carry out divisive, single-handed policymaking, something he is renowned for as part of what some claim is an authoritarian style of leadership. Heightened tensions in run-up to the election as campaigning gathers pace. Elections taking place under a ‘State of Emergency’, put in place in 2016 following a failed coup attempt. Violent election unrest already reported in isolated incidents. Possibility to escalate. Strict restrictions on public gatherings and demonstrations could result in violence should authorities intervene. An increased threat posed by both domestic and international terrorist organisations looking to capitalise on the elections by carrying out attacks. UK FCO, Canada, Australia and New Zealand issue similar travel warnings or advisories. President Erdogan likely to remain proactive in clamping down on subversive organisations that pose a threat to the regime stability. Further operations by security forces targeting Gulenists (FETO), Daesh (Islamic State, IS), Kurdistan Freedom Falcons (PKK) and the People’s Democratic Party (HDP) members. Possibility of reprisal attacks. Keep a low profile at all times. Avoid demonstrations and large gatherings. Even events which look peaceful can quickly turn violent without warning. Turkish security forces are likely to respond in force to any violent unrest, especially at unsanctioned events. This will possibly include the use of crowd dispersal methods such as CS gas (tear gas). Be aware that if you are caught near to any protest action you could be mistaken for a participant. Monitor local media although be mindful of the potential for censorship.